After the quite interesting first day in Houston, I was excited to discover more attractions of the city. I started the day by putting on my proud dark-pink NASA t-shirt that I purchased the day before. I had to take the Amtrak train to Tucson at 6:55 PM, so I couldn’t be too lazy. After having a simple breakfast, I decided to head for the museum district that every guidebooks seemed to be praising. According to its website, Houston museum district has 19 museums over the four walkable zones. I never thought of Houston as an art city like NY or Chicago. But looking back, it was obvious that Houston has such good art museums because it is usually the riches who are good art collectors, and Houston is not short of the riches, it seemed. The first museum I headed to was the Menil Collection. Like Whitney Museum, Guggenheim, or J. P. Morgan Museum in NY, the founders of Menil Museum were the rich people, the late Mr+Mrs Menil. The main building of the museum that is so famous to have precious artworks from all over the world was under construction (until September 2018.) But I did not hesitate to go anyway because I really wanted to visit the Rothko Chapel, a project also commissioned by Menils, that is right beside the main building. I took a bus (#82, day pass $3) to go to the Chapel. Maybe it would be more appropriate to call it a ‘chapel’ with a small ‘c.’ It is not intended to accommodate any particular religion. It is just a place to find something ‘spiritual,’ whatever that word means to an each visitor. Not like many museums in NY, it was free. I was grateful about the generosity of Menils. Like many travelers visiting the US, I had this stereotype about the museums founded by the riches. A family gets or is rich that they have so much money to spend for something valuable. Buying something like a handbag wouldn’t work, because they would need to buy sooooo many of them to spend all the money. So they decide to buy art works, that are known to have so many digits on their price tags. After collecting considerable volume of collections, they build a museum as a goodwill to the society. Then I (the tourist) go, and enjoy them for a reasonable ticket price, right? However, these Menils were a bit different. They didn’t stop at BUYING the artworks. They called the artists and asked them to do some project for THEIR museum. They would build a building for the projects, so fitted to the style of the artists. You know, like Medici family of Renaissance Italy used to do. And there the Rothko Chapel was. The building so solemn and tranquile with the paintings of Mark Rothko covering every walls. Fourteen huge paintings were hung on the walls of the high ceiling chapel. Perhaps it is more appropriate to say that the walls were built for the paintings. I always adored Mark Rothko’s paintings, but being inside the building overwhelmed with his paintings was nothing like seeing one or two painting of him (with other artists’ paintings nearby.) It felt like being captured inside the artist’s mind. 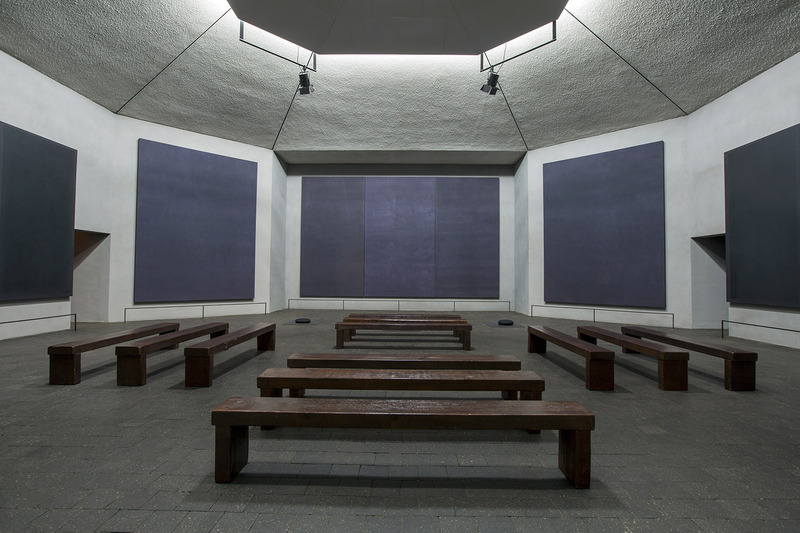 It was a bit depressing to learn that Rothko committed suicide not long after finishing the project and he didn’t get to see this beautiful chapel. Sculpture right in front of Rothko Chapel, dedicated to Martin Luther King Jr.
At this point I finally looked up who these Menils are (yes, I had no clue who they were) and found out they got rich from the oil and finance industry. It was interesting that NY Times actually called them Medici of the modern society. I had a few hours left before heading to the train station. There were so many interesting and small museums on museum district, but I decided to finish my journey in Houston by visiting the representatively large museum in the district, The Museum of Fine Arts. It was huge museum with well curated artworks (and of course, super strong A/C.) It curated whole range of artworks, from old time European to cutting edge contemporary 3D printer produced sculptures. Personally, I especially enjoyed the artworks by Edward Hopper and Henri Matisse. It was especially interesting to see another example of what the riches can do for artists. There were a huge artworks by Henri Matisse and Fernand Léger, that Nelson Rockefeller commissioned for the fireplace in his Manhattan penthouse! Wow!!! How nice it would be to look at the empty wall of your new penthouse thinking ‘hmm… I should call that Matisse guy to paint it for me’ (I can do this thinking too, of course except the penthouse part, haha) and then REALLY order the artwork tailored for the space! Thanks to the city and the riches, the Museum of Fine Arts was also free. On my way out, I visited the museum gift shop to buy a magnet to give my mom (=the magnet collector!) and colored pencils to use for my drawing practices, thinking ‘well, maybe it might be super cool to be super rich!’ Money surely cannot buy everything but it certainly CAN buy something, I learned in Houston. Frankly, I did not expect much from Houston. People I know had been telling me negative things about the city. One friend told me I would be wanting to leave as soon as I arrived because it should be so hot and humid. Another person said the city did not have much thing to enjoy as a traveler. However, while staying in Houston for two nights, I found it quite contrary to my negative prejudice. First, Houston was the coldest city I have encountered during this trip. Of course, the temperature was high and yes, it was humid. But the A/C was absolutely stronger than any other city I’ve visited. Moreover, I encountered a few rain showers in the afternoon that cooled down the city dramatically. It was like pouring cold water to a sizzling pan. And the second point, ‘not-much-to-enjoy’ (aka ‘boring?’,) was certainly not true. I truly enjoyed the world-famous Houston Space Center and well curated museums established by the Southern philanthropists. So here’s how my first day in Houston went by. I started my day with a simple breakfast (more like snacks but sufficient for me: bananas, breakfast bars, coffee etc.) provided by the hotel, Club Quarters Houston. The hotel chain primarily serves its member organizations, then opens up its rooms at reasonable price when there are some rooms left. The hotel was very clean, and the location was also good. The best thing for a long-term traveler like me was the free Whirlpool laundry & drying machines (six of each) on the basement. Right after the breakfast I headed to the place I have been wanting to go for decades, NASA Space Center Houston! I usually prefer public transportation but this time decided to rent a car, because it was 30 mins by driving but 1.5~2 hours by bus. Yeah, the Lyft driver was right about Houston being the city of car, car, and car. I printed out the temporary membership card at the hotel and drove 30 mins to the Space Center. As soon as I was entering the parking lot, I was greeted by the huge Space Shuttle (real size mock up) and its carrier Boeing 747 airplane (original.) Space Shuttle was on top of 747, just like the good old days when they flew together across the country. When the Space Shuttle (now retired) landed on Earth, it had to be carried by other vehicle to its home in Florida. It was fascinating to find out that moving the space shuttle by another airplane was the result of one enthusiastic outside-of-box thinker, John Kiker. As I entered the main center, I headed straight to the tram station. There are mainly four parts to the space center visit (all included in general admission): 1) inside museums (where you can touch the moon rock!) 2) Space Shuttle and Boeing Carrier (inside and out) 3) tram ride to the historic mission control center 4) tram ride to astronaut training center. I jumped to do the one of the tram rides first, because the weather report said it would be raining hard that afternoon, and when it rains hard the tram tour would stop. Thanks to the membership, I could ride the tram to the historic mission control by waiting only about ten minutes. The non-members’ line was very long, looking like a good 40 mins wait. The open-air tram took us to the historic mission control room after about 10 mins ride. It was interesting to see longhorns looming around the center. It’s Texas, for sure there are longhorns, right? NASA preserved the room so well that it even had ashtrays on the observing room that we the visitors were allowed to stay for a while (The observing room was originally built for the families of astronauts on mission.) The guide told us that they were preparing for 50th anniversary of moon landing (1969) next year and hot debate was going on regarding whether to allow visiting people to smoke in the control room, just like the old days. As we were coming back from the control room, rain started pouring down, literally soaking us all like in a shower. We jumped into the icy cold air-conditioned museum building as soon as the tram driver dropped us off. We had brief lunch at very good cafeteria on the first floor while trying to dry ourselves. I ended my Space Center tour with a one more visit to the space shuttle and the very well stuffed gift shop. I bought those cool ‘NASA’ t-shirts that every tourist was wearing and NASA stickers for my MacBook. On a way to Space Center, Space McDonalds (?). Who said Houston was boring?